Decades-old palms in new home before Casas de las Flores affordable housing. By Angel Pacheco for Peoples' Self-Help Housing | Published on 07.28.2015 9:38 a.m. 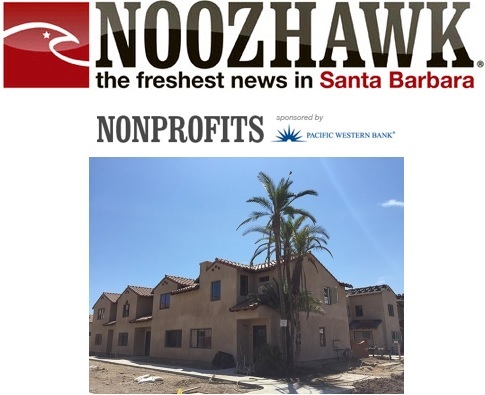 Seven palm trees that were temporarily relocated at Peoples’ Self-Help Housing’s Casas de las Flores affordable rental complex have been replanted at the site in preparation for the property’s opening in October. Casas de las Flores, which will feature 43 town house-style apartments, is currently under construction at 4096 Via Real in Carpinteria, the former site of the Carpinteria Camper Park. As part of its construction and development at the site, PSHH temporarily relocated the palm trees on site and continued to care for them. Crews recently replanted the beautiful, drought tolerant trees, incorporating them into the Casas de las Flores project. The beloved palms were a popular landmark for travelers on the adjacent 101 Freeway, and there have been many inquiries about them from the public during the 18-month construction. The project's landscape architect Rob Fowler said the trees could be 35–40 years old, and the drought hardiness of palms increases as they mature. The palms stand at 25–35 feet and include three Canary Island Date Palms and four Senegal Date Palms (also known as Phoenix reclinata). Peoples’ purchased the extremely blighted camper park from an absentee landlord more than a decade ago and successfully located replacement housing for the 80 households who were living in very poor conditions on the property. After years of preparation, Peoples’ broke ground on the new housing project in April 2014. The formal ribbon cutting and grand opening event will be Oct. 15, 2015 at Casas de las Flores from 11:30 a.m. to 1 p.m.
With nearly 1,200 self-help homes completed and over 1,500 rental units developed, PSHH is the largest affordable housing developer on the Central Coast, with offices in Santa Barbara and San Luis Obispo. For more information on Peoples’ Self-Help Housing, visit pshhc.org, email info@pshhc.org or call 805.781.3088. —Angel Pacheco represents Peoples' Self-Help Housing.